"You should never have come back to Eden." Macross Plus has long been a title recommended for newcomers to the anime genre as a great introduction to what can be done in the medium. The series was originally released as a four-part OVA on DVD in 1999, and quickly became an essential in the collection for its action-packed story, breathtaking visuals and impressive soundtrack. The only real disappointment on the OVA release was the lack of a Japanese 5.1 soundtrack, as its English counterpart was a benchmark for the genre. Director Shoji Kawamori went back to the drawing board (literally) for this version which, unlike many other so-called movie editions, isn't just jamming OVAs together for a longer running time. Here, there are notable changes to the content, and the focus has shifted somewhat from the original, which enhances the presentation significantly. A half hour of new animation has been added, adding depth to the characters, creating a concise and exciting movie experience in this director's cut. The year is 2040. On the planet Eden, tests are being conducted by the Ministry of Defence on the next generation of transforming fighter craft. Isamu Dyson, a young hotshot, has returned from deep space to test pilot one of the contenders, but his recklessness and no holds barred approach to flying has his superiors concerned. He pushes his craft to the limit, far exceeding the test guidelines, and executes a series of maneuvers that astound his audience, including some elaborate skywriting—a signature that the designer and pilot of a competing fighter, Guld Bowman, instantly recognizes. The planet is abuzz about the arrival of the galaxy's biggest celebrity, a "virtual" idol singer named Sharon Apple. A computer construct, her music has won the hearts of millions of fans, and her virtual reality concerts are an experience few want to miss. Isamu and Guld both recognize the singer's producer, Myung Fang Lone, from the TV broadcast heralding Sharon's appearance, and both men set out to find her. The three are not strangers to this planet, with its wind farms and rolling hills, and as Myung gazes at the sun setting across the ocean, her memories are alive with the past. The first man to find her is Guld, knowing she would return to the spot where the three of them played as youngsters, but the reunion is bittersweet, as something happened seven years before that shattered their bond of friendship. When Isamu arrives it is clear there is much tension in the air, though its cause will remain a mystery for now. While the rivalry in the air is intense as the testing program continues, the animosity between Guld and Isamu centers on Myung, with both men vying for her love. For fans of the Macross series, the elements that made that show great—relationships, music and mecha—are taken to new heights here, and for those unfamiliar with the original, Macross Plus is "must see" anime that works on many levels. Relationships are the heart of this series, as the story of Myung and the two pilots unfolds in perfect order. The title has been compared to Top Gun for the intensity of its aerial combat sequences, which is certainly fitting. The show excels in the action department, featuring exhilarating, high speed flight scenes that catapult the viewer into the pilot's seat in adrenaline-charged spectacles. Last, but certainly not least is the music of Sharon Apple—haunting, and powerfully emotional, creating a fantastic sonic atmosphere for the story to play against. The music in this show is awesome, and its integration and presentation is almost flawless. The animation quality is incredible on all fronts, from the detailed mecha to the sultry and vaporous idol singer who is the center of attention. The character design is wonderful, and the cinematography is stunning, from the rush of the high-octane flying sequences, to the immersive concert footage as Sharon seduces the audience with her music. Sound design is brilliant, creating a lively mix that is destined to be another showcase. Voice-acting is also excellent, and includes the talents of Rika Fukami (New Cutey Honey), Takumi Yamazaki (Hans from A.D. Police), Unshou Ishizuka (Jet in Cowboy Bebop), Mako Hyoudou (Outlaw Star) and the inimitable Megumi Hayashibara as Isamu's girlfriend Lucy. While the OVAs still remain a top pick, this movie version takes Macross Plus over the edge, and bests the former in terms of overall impact. In short, Macross Plus: The Movie rocks! Image Transfer Review: This series has some of the best looking animation out there, and image quality seems pretty much on par with the OVA release, meaning you can expect a great picture. Colors are crisp and brilliant, black levels are solid. An average amount of aliasing is about the only real fault here. Dark blue regions do exhibit some grain as they did in the original. This is still one of the better looking images out there. The one caveat is that this is hard subtitled, so those who prefer to watch their anime raw will be disappointed. Audio Transfer Review: While the OVA set only had a 2.0 track for the Japanese language, Macross Plus: The Movie gets a significant upgrade here in an impressive 5.1 mix that definitely has it where it counts. This track is incredibly expansive and packs a lot of punch during battle sequences, and is fully enveloping for the concert footage. The sound design is exceptional, bombarding the viewer from all corners, showcasing the beautiful and evocative music that forms a centerpiece in the show. This surround track has everything I could hope for, and ranks with the best 5.1 soundtracks, in any genre, that I've heard. The 2.0 track is still impressive, but doesn't have nearly the impact of the 5.1 version. No English dub is included. 1 Other Trailer(s) featuring compilation trailer for other Manga releases. Extras Review: The extras set contains a few useful items. Since the feature's credit role is in Japanese, English credits for the four OVAs are included in this section. Character bios briefly cover the principles, plus the primary mecha. A 14-image gallery combines promo art with screen captures from the show. Trailers for the original OVA releases are also included, running just under 4 minutes total. Like their other discs, Manga's stock promotional extras cover their other titles and associated merchandise. The Manga trailer features a compilation of clips from Ghost In The Shell, Ninja Scroll, Perfect Blue, Patlabor, Street Fighter, X and other titles. 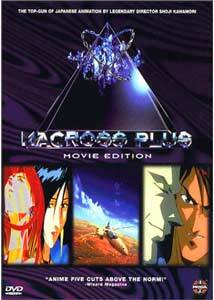 An excellent choice for newcomers to the genre or seasoned fans, Macross Plus: The Movie is an anime essential, with a well developed and powerful story, great visuals, intense action and an awesome soundtrack by Yoko Kanno. The 5.1 upgrade to the Japanese language track is stunning, and while fans will want both this and the OVAs (which provide different footage and content), those who must make a choice and can handle the subtitles, this is the way to go. This gets my highest recommendation.